Using a pastry bag makes adding the raspberry centers much easier. In a bowl, combine GF flour, rice flour, and xanthan gum. With a mixer, cream together butter and sugar. Add egg yolks and almond extract and beat until incorporated. Add the flour mix to the creamed butter bit by bit, waiting for each addition to be fully incorporated before adding the next. Set the cookie dough in the refrigerator to chill for 10 minutes; it should be firm but not hard when at the proper temperature. 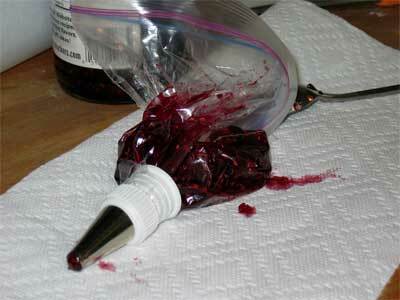 While it chills, put the raspberry preserves into the pastry bag. 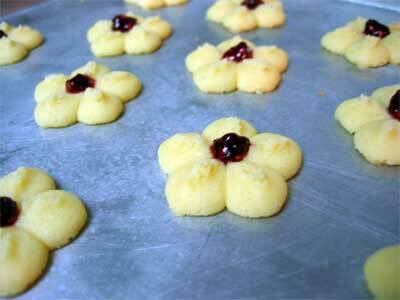 When the dough is ready, spoon it into the cookie press with a flower pattern disc. Force dough through the press onto an ungreased cookie sheet. Use your pinky finger to gently tap the center of the cookie so that there is not a hole between the segments. Pipe in a very small amount (1/4 ts or so) of raspberry preserves. Bake at 350F for 12-13 minutes, or until light brown on the edges. The raspberry center should be slightly bubbly. This is what the cookies should look like before they go into the oven. Too heavy on the preserves and they’ll be runny, too little and they just won’t taste as good. Do not try to press cookies onto a hot cookie sheet. The butter will melt and they will run. If your cookies will not come off the press, check the dough temperature. Too warm, and the butter will be too soft to separate when you pick up the press; too cold, and the dough will be too hard to separate. Make GF almond meringues with the leftover egg whites. Made this recipe yesterday. A huge success!! Following your directions, the dough came out of my spritz gun beautifully – didn’t stick. This recipe is a ‘keeper.’ Thanks.